Topics: Compliance Training, Hs&e Services, Assessments, Osha Fines & Citations, and Cost Containment. 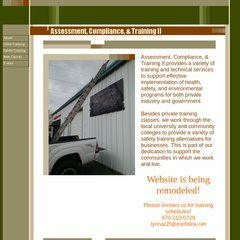 ac2t.com OSHA Fines & Citations...How much will you pay? Its IP Number is 66.175.58.9. dns2.earthlink.net, dns3.earthlink.net, and dns1.earthlink.net are its DNS Nameservers. It is hosted by Cedant Web Hosting (California, Davis,) using Apache web server.